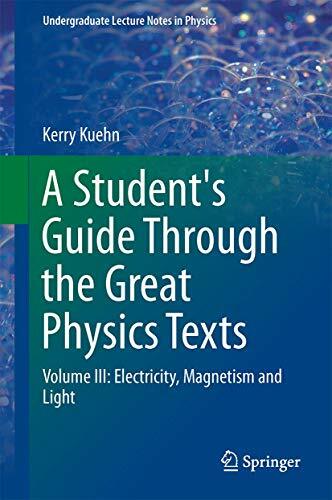 [PDF] A Student's Guide Through the Great Physics Texts: Volume III: Electricity, Magnetism and Light (Undergraduate Lecture Notes in Physics) | Free eBooks Download - EBOOKEE! Description: This book provides a chronological introduction to the electromagnetic theory of light, using selected extracts from classic texts such as Gilbertâ€™s De Magnete, Franklinâ€™s Experiments and Observations on Electricity, and Huygensâ€™ Treatise on Light. Particular attention is given to the works of Faraday, Maxwell and Heaviside, scientists who unified the formerly separate disciplines of electricity, magnetism and light. Their electromagnetic theoryâ€”developed during the 19th centuryâ€”would lead to the invention of modern radar, electrical power grids, and telecommunication networks. Each chapter of this book begins with a short introduction followed by a reading selection. Carefully crafted study questions draw out key points in the text and focus the readerâ€™s attention on the authorâ€™s methods, analysis and conclusions. Numerical and laboratory exercises at the end of each chapter test the readerâ€™s ability to understand and apply key concepts from the text. Electricity, Magnetism and Light is the third of four volumes in A Studentâ€™s Guide through the Great Physics Texts. This book grew out of a four-semester undergraduate physics curriculum designed to encourage a critical and circumspect approach to natural science while at the same time preparing students for advanced coursework in physics. This book is particularly suitable as a college-level textbook for students of the natural sciences, history or philosophy. It can also serve as a textbook for advanced high-school or home-schooled students, or as a thematically-organized source-book for scholars and motivated lay-readers. In studying the classic scientific texts included herein, the reader will be drawn toward a lifetime of contemplation. No comments for "[PDF] A Student's Guide Through the Great Physics Texts: Volume III: Electricity, Magnetism and Light (Undergraduate Lecture Notes in Physics)".